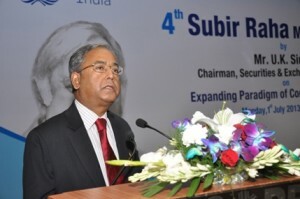 Mr. U. K. Sinha, Chairman Securities and Exchange Board of India (SEBI) delivered the 4th Subir Raha memorial lecture, organised by Global Compact Network at New Delhi, on the theme “Expanding Paradigm of Corporate Governance’. Mr. Sudhir Vasudeva, ONGC, CMD and President, Global Compact Network India, Ms. Lise Grande, UN Resident Coordinator and UNDP Resident Representative in India, Dr. S.P.S Bakshi, CMD, EPIL, Mr. Bharat Wakhlu, Resident Director, Tata Group, Mr. B.P Tayal, CMD, Konkan Railways Corporation, Dr. A.K. Balyan, MD and CEO, Petronet LNG and several eminent and senior corporate executives, media persons and students were present at the event. Mr. U.K. Sinha was appointed as Chairman of Securities & Exchange Board of India with effect from February 18, 2011. Mr. Sinha, formerly from the Indian Administrative Service – the civil service in India, brings with him rich experience in the financial markets for more than a decade. Prior to taking over as Chairman at SEBI, he was Chairman & Managing Director of UTI Asset Management Company Ltd. and Chairman of Association of Mutual Funds in India. He has earlier held several key positions with distinction in the Ministry of Finance, Government of India and has actively contributed to the financial sector reforms in the country. He is also credited with starting the micro pension movement in India. He was also the Chairman of the Working Group on Foreign Investment in India formed by the Government of India. He was a member of several committees set up by the Government of India including the Committees on Liquidity Management, Foreign Institutional Investors, Corporate Bond Market and Investor Protection. Mr. Sinha is also currently Chairman of the Asia Pacific Regional Committee of International Organization of Securities Commissions (IOSCO). Mr. Sinha recalling his interactions with Mr. Raha, applauded him for his dynamism and commitment. Paying his respect to the great leader Mr. Sinha remembered his initiative in taking ONGC on the path of transformation. In his lecture, Mr. Sinha stated that effective and transparent corporate governance is the key to achieving economic advantage and market success. He iterated that with the growing demand for efficient governance from new quarters, the realisation for the increasing need for transparency, ethical operation and fair conduct has been felt. He reiterated the increasing role of SEBI in ensuring that corporates do not use mal-practices and follow established ethical norms of business operations.